I have to admit that I’m quite grateful that we’re now in our final month of Winter. I simply cannot wait for the cheeriness that Spring brings-the new green growth, fields of lambs and sense of fertility and hope. LISTEN TO THIS POST ON ITUNES! However as I can now see the light at the end of the gloomy, cold winter tunnel I feel I owe winter a final thank you and so I plan to enjoy February, in all it’s late winter beauty. We can take this idea of purification and apply it to our homes as well. Cleaning out cluttered wardrobes, cupboards and freshening up interiors. Even looking to our daily rhymes and changing them as needed. I’ve been reading a wonderful e-book by Whole Family Rhythms which is all about this idea of rhyme in the home. So far it’s already motivated me to rotate and store some of Rupert’s overflowing toys (leaving a tidier home! ), spruce up my meal planning and put the ritual and gratitude back into meal times. Now, some of you will already be aware that I have started up a little monthly bookclub. Focuinf on non-fiction books in the genre of natural living and nature. Last month we read The Wild Remedy by Emma Mitchell and this month we are reading The Light in the Dark by Horatio Clare. This is part winter nature journal and part journal echoing his struggle with mental health. So far it’s an excellent read well suited to late winter. 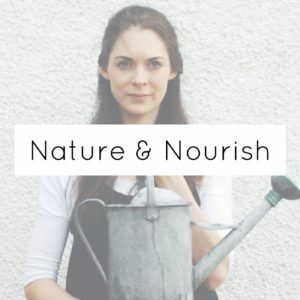 If you want to join in the discussions come and join our Nature & Nourish FB group. Link above in the menu! There are a few pinnacle festivals during the month of February. Valentines day of course divides the room as always. Personally I’m a fan although don’t fall for big bouquets of imported flowers and cheesy cards (I’ll take the chocolates though!). For me Valentines is a good excuse to celebrate love, whether it’s platonic or intimate and remind me to be grateful for each day spent with these people. This year I will indulge myself and enjoy cooking a feast for myself and my family. Probably diving into Nigella’s huge tome on the subject. I’ll also whip up some raw chocolate bars and fill the house with bundles of early daffodils. And While I avoid out of season roses I do have a jar of dried rose petals which make an incredible infused tea, or honey and are known to be a perfect herb for the heart and self care. I always feel more balanced and grounded after consuming rose and recommend it fully to everyone! Its such a beautiful herb! Imbolc is another key festival marking the first signs of Spring and lengthening days. The goddess Brigid associated with this festival was later on Christainized into St. Bridget, and corn dolls and crosses are still made to celebrate this time. Candlemas is celebrated on the 2nd of February, this Christian festival of light is a celebration of Jesus’ arrival at the temple. Traditionally candles are lit for candlemas and snowdrops picked. Apart from Rose petals and valentine feasts Other lovely things that I will be filling my kitchen with in February are Big preserving pans bubbling away with the tart sweetness of seville organges. Marmalade is a real favourite of my husband so I try and make some each year when the fruit is in season. I also have a few blood oranges which I’ll make into a wintery blood orange and almond cake for our farm shop cafe. Other treats that are in season are rhubarb, imported passion fruits (very timely!) And pineapples and then of course our winter veg such as leeks, cabbages and roots are still providing. I adore Mimi Thorisson’s recipe for braised leeks with a strong vingetette and plan to cook that this weekend with last of this season’s venison. Our purple sprouting broccoli is still producing and is at it’s best now. A real treat after all those Brussel sprouts! Make sure you don’t overcook it, young, tender shoots need just a short steam or boil to be perfectly delicious. Although Spring is but weeks away, February can be a cruel month. Ice cold temperatures, snow, frozen ground…For this reason it’s really important to feed the birds and keep water sources ice free. I have a simple lard bird ball recipe over on the blog which The birds will really appreciate at this time of year! If the ground isn’t too frozen you can still plant bare rooted trees and shrubs as well as snowdrops, aconites and bluebells in the green. Planting these in the green as opposed to bulbs has a much greater success rate for these particular plants! 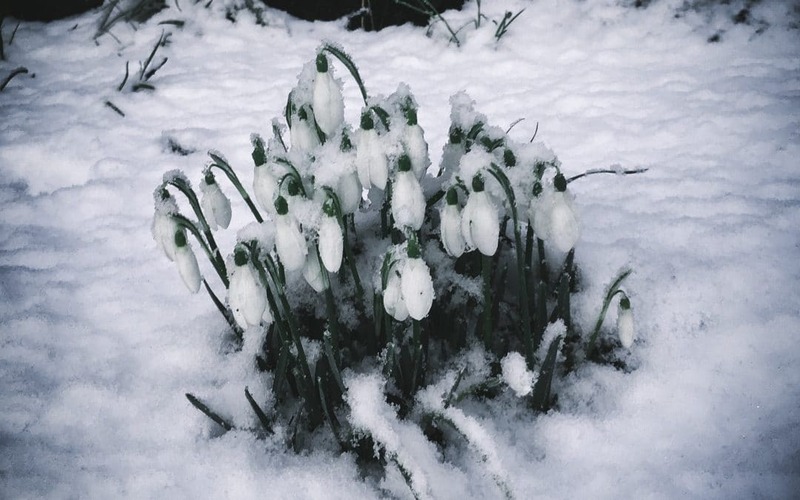 There are some blooms that do brave the cold and you can keep your eyes peeled for hellebores, golden aconites, snowdrops, daffodils, primroses, scented Daphne, cyclamen and crocus. If you have hedges or shrubs that need a tidy, get them pruned this month as next month nesting begins in earnest and we wont want to disturb any new nests. In fact this would be a perfect time of year to put up a nest box ready for the birds. If, like me, you’re itching to get sowing seeds then try beetroot, lettuce radish, salad onions, peas, chillis and board beans started off undercover or on a windowsill. This will get you some nice early crops. You can also sow some sweet peas ready for beautiful flowers in summer! I’m doing final garden planning this month too, buying in seeds and compost, checking tools and seed trays before the busy period arrives! Although wildlife is still quiet in February you should be able to notice an increase of birdsong, especially from the mistle thrush! Toads and frogs are also busy this month pairing up for mating season so keep an eye out for the first of the spawn. Finally You may even see a queen bumblebee on the hunt for nectar and a new nesting spot!